First Line: Edie Kiglatuk had no way of knowing how long the bear had been looking at her. Against her better judgement, Edie Kiglatuk promised her ex-husband that she would help him in his bid to win the Iditarod-- the most famous sled dog race in the world. Edie's never been so far from home, and she misses it terribly, especially when she stumbles upon the frozen body of an infant on land belonging to an exiled Russian Orthodox religious sect. Edie's blocked at almost every turn in her attempt to find out what happened to the baby. It's election time, and candidate Chuck Hillingberg doesn't want an inconvenience like a dead child to damage his chances of becoming the next governor of Alaska. Hillingberg hasn't come up against anyone quite so stubborn as this half-Inuit, half-white woman though. Edie's not going to quit. Because she's not only fighting for justice for an innocent child, she's fighting demons from her own past. Anchorage, Alaska is the farthest south Edie Kiglatuk has ever been, and she doesn't like it much. For one thing, there's too many trees. For another, it's almost impossible to find anything that's fit to eat. 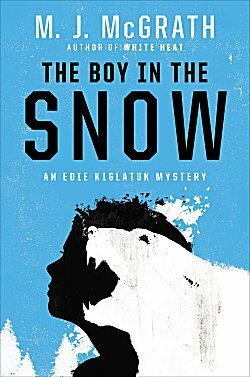 A good deal of my enjoyment in reading The Boy in the Snow came from watching her try to acclimatize to Alaska. It's something that I certainly would have to do as a bonafide desert dweller, but I'd certainly be coming at it from an entirely different direction! I was rather sad that the book has more to do with politics and greed than it does the Iditarod, but that's the way this story panned out, and I adjusted well. McGrath shows that Alaska still has ties to Russia (something that I hadn't thought of but should have), and if anything there were a few too many bad guys roaming around. I almost needed a scorecard. Having read the first book in this series, White Heat, as well as a short story, I found that I had the most difficulty with Edie herself. I don't remember her being quite so ill-tempered and combative. Of course, her behavior undoubtedly has a lot to do with those demons from her past, the dead baby, and her dislike of Alaska. Edie is used to getting from place to place on foot, with a dogsled, or possibly on a snowmobile, but here she has to drive cars and trucks. This isn't a good mix for woman nor machine. As someone with her says, "Edie doesn't drive. She bulldozes." And that's how Edie investigates, too. She doesn't pay attention to the good advice her friends give her; friends who'd help her more if she let them. All in all, Edie is her own worst enemy here, and I'm hoping that she's on a more even keel in the third book. I may give this one a go, or not. I liked White Heat, but The Bone Seekers was a DNF. I just couldn't get into it. But ties of Alaska to Russia? Absolutely. Remember Alaska Gov. Sarah Palin "could see Russia from my home!" To be honest, I've forgotten a lot of what Palin said. I remembered Alaska being part of Russia, of course, but like a dummy must've thought all ties were cut with our purchase of it. Duh!